LED Scoreboards deliver a front row viewing experience to viewers sitting in every corner of the stadium. It is a multi-purpose display used for showing live scores, replays, animations and advertisements. Through Xtreme Media Digital Signage Software, our clients can split the display to showcase multiple information on at the same time and accurately broadcast real-time updates. Xtreme Media is known for providing end-to-end solutions for LED scoreboards including the screen, structure, controlling, software, templates, support & maintenance. 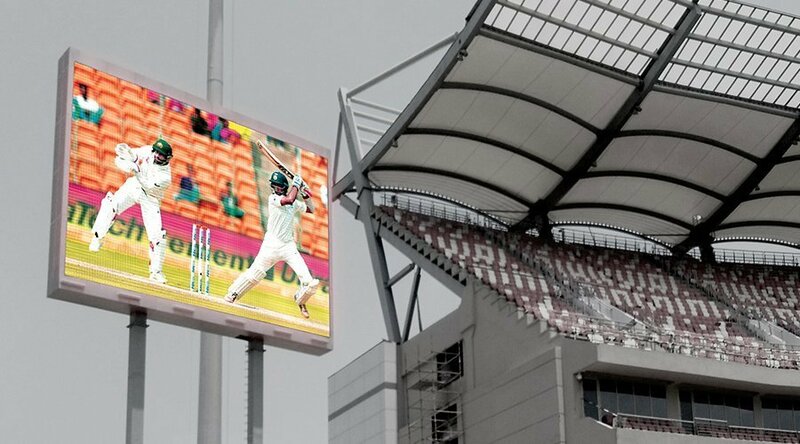 Our LED scoreboards are high brightness screens, robust and weatherproof suitable for outdoor conditions. Details : 16 mm Stadium LED display of size 40 ft. x 25 ft. The Barsapara International cricket stadium houses international cricket tournaments and is one of the finest stadiums in the country. It has the seating capacity of 40000 people and is equipped with modern facilities.